Reserve your ticket to confirm your seat! Suggested donation of $5 will help cover costs of the screening. If tickets are sold out, please sign up for the waitlist! We are actively releasing tickets as they become available! A donation will assist the organizers in covering expense for the screening. "The Sultan and the Saint"
During the Crusades, Saint Francis of Assisi risked his life by walking across enemy lines to meet the Sultan of Egypt, the Muslim ruler Al-Malik Al-Kamil. This remarkable encounter, and the commitment to peace of the two men behind it, sucked the venom out of the Crusades and changed the relationship between Muslims and Christians for the better. Featuring dramatic reenactments and renowned scholarship, this amazing story is brought to life. Scholars interviewed include Michael Cusato (St. Bonaventure University), Sr. Kathy Warren (Sisters of St. Francis), Suleiman Mourad (Smith College), Homayra Ziad (Institute for Christian & Jewish Studies), Paul Moses (The Saint and the Sultan), and others. 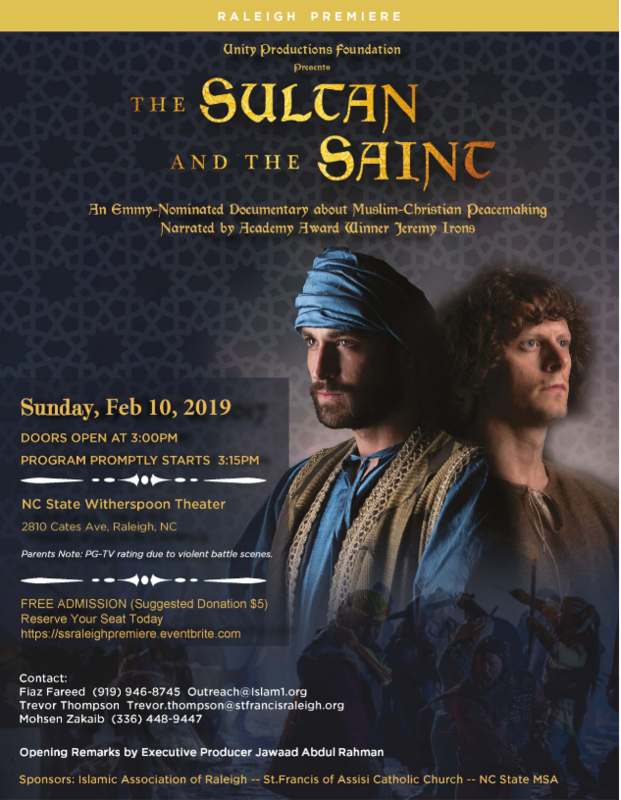 Join us for this premiere to learn about the remarkable spiritual exchange between the Sultan and the Saint, and the great risks they took for peace. The film contains some scenes of violence and may not be appropriate for children under 12. PBS gave this film a PG Rating. Please use your own discretion. “The Sultan and the Saint" can model anew how Christians and Muslims can meet one another in dialogue while also providing a medium to cultivate greater understanding, in a present day when angry and debasing discourse bear eerie similarity to the setting in which Francis and al-Kamil met. (Sultan and the Saint) may also cause us to ask why encounters such as the one it dramatizes are too often left unremembered and unstudied while the bloody battles that the men of faith strived to stop become the foundations of our cultural assumptions for centuries to follow.